It is common for dogs to want to eat the foods that we eat. That’s mostly because dogs love food and cannot differentiate what they can and cannot eat. If you are aware that some of your food might be harmful and could even be deadly for your furry friends, we are sure you would not risk exposure. In this article, we will give you insightful notes on human food that’s detrimental to your dog’s wellness. Read on. The darker the chocolate is, the higher its toxicity for your pet. It can cause seizures, fever, abdominal pains, dehydration, agitation, irregular heartbeat, and ultimately, death on dogs. 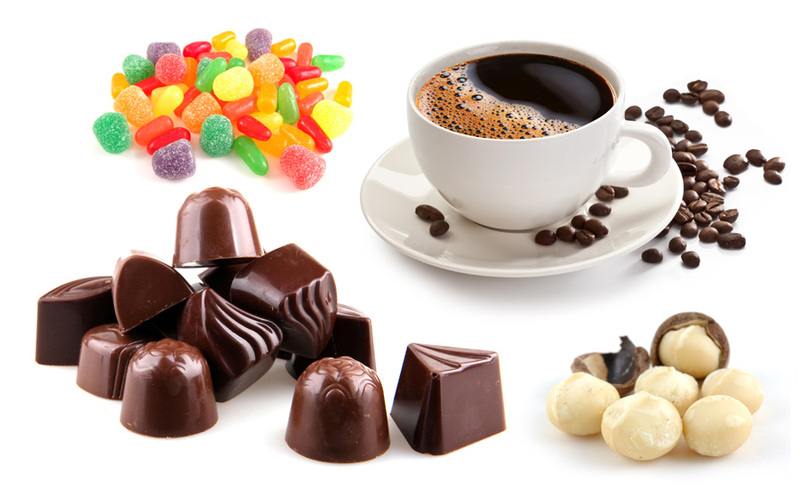 Chocolate’s caffeine and theobromine content fall under the methylxanthines category, which is harmful for your dog’s system. Make sure you do not give your dog coffee. It has caffeine, the same element that make chocolates bad for them. Do not feed them with sashimi. Raw salmon is heavily infected with parasite that’s loaded with the bacteria Neorickettsia Helminthoeca, which can be fatal to them. Trout also bears warning signs. Dogs are not equipped with enzymes that can breakdown lactose as humans. So it is not wise to feed them with milk and milk-loaded products. They could have intestinal troubles and diarrhea. Do not feed your dog macadamia nuts. If they ingest even a small amount of this nut, they can be affected greatly and may suffer from depression, weakness, tremors, and hypothermia. That said, you must be careful handing over a bite of cookie, candy, or cake because it might have some on them. Sugar in itself is harmful for your dogs so you must be careful feeding your dogs with food items that are loaded with sugar. Plus, candies might have chocolate or macadamia nuts so it really is a no-no. As for gums, they can cause trouble on your dog’s bowel system once swallowed. Both candies and gums may also contain Xylitol a sweetener that’s also found to be fatal for dogs. There are few studies that can establish the reason behind this. All the scientists know at the moment is that grapes and raisin ingestion may lead to kidney failure among dogs. At first, they will show signs of hyperactivity and repeated vomiting. After a few days, they will suffer from depression and exhaustion. Dogs do not need much flavor in their food. Garlic may be okay if given in small amounts but if you overfeed them with it, it can already be toxic. As for onion and chives, they have sulfoxides and disulfides that are utterly dangerous, especially for small pups (and even for cats) because they can damage your pets’ red blood cells and inflict them with anemia. Do not pass on your smoking and drinking habit to your furry friend if you do not want to jeopardize its health. If the nicotine content of tobacco is bad enough for humans, it is even worse for dogs as it can make them pass out, suffer from a heart failure, and die. Those are almost the same effects that marijuana has on dogs, apart from the fact that it can induce repeated episodes of vomiting. As for alcohol, intoxication can easily result not just in hyperactivity and lack of coordination but also in coma and death. In movies, we often see dogs with a huge animal bone in between their teeth but the truth is, this can be hazardous to them. For domesticated pets that do not have an experience hunting and eating in the wild, bones can easily get lodged in their throat. They could also puncture your pet’s digestive tract. If you have a small dog or even a large one who is not greatly exposed to hunting, don’t feed them with table scraps that have bones in them. Sticking to a prescription diet for your pet friends is much better than giving them the same thing that you have on the table. Dogs are not humans. They do not have the same mechanisms that can digest certain foods the way we do. Next time you are turning to table scraps to throw some for your dog, think twice. You might be giving your beloved pup something that could affect it negatively, otherwise cause death. If you are to give human food to your dog, keep in mind that mostly, lean meats, certain fruits, cooked eggs, raw veggies, and white rice are recommended. Anything other than those could be potentially dangerous and may cause health problems once ingested. Consult the dog experts, like those from Petsmart to be on the safe side.